Perhaps I am a bit more sensitive – or at least attuned – to this awkwardness because my own pedigree is awkward given my current research field. It isn’t that I didn’t have an exceptional supervisor who had a major impact on my career and thinking. I did – his name was Tom Quinn and without him I wouldn’t be here. Moreover, he is a famous scientist who is extremely influential in his field – his work has been cited 25,000 times! It is just that he works in a scientific field – salmon ecology and behavior – that is very different from my field – evolution. Thus, saying his name in front of a bunch of evolutionary biologists will typically evoke blank stares. So does this mean I don’t have a valuable pedigree? Or does it mean that knowing a pedigree is unhelpful? This focus on pedigree permeates other contexts in science. During job searches, some people on the committee think higher of some applicants simply because they went to Harvard or Yale, or because they were supervised by this or that National Academy Member, or by this or that famous ecologist or evolutionary biologist. 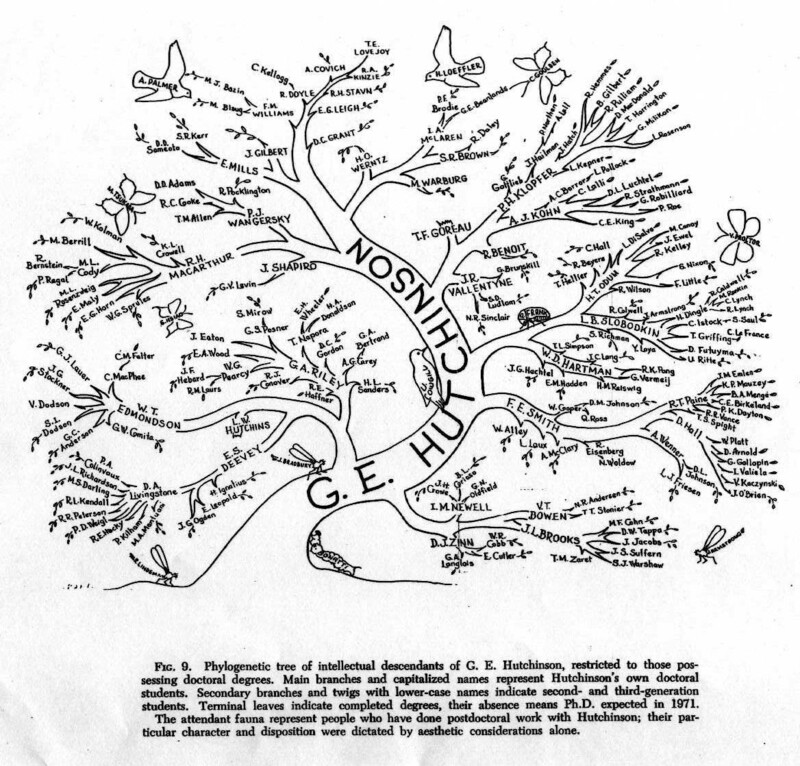 And then there are the web sites where you can enter your academic pedigree and (hopefully) link your self to someone super-famous – Odum or Hutchinson (see above) or Elton or whomever. On the other hand, an illustrious pedigree can work against you in some contexts. For instance, papers in PNAS by students or collaborators of National Academy of Sciences members are always suspect. That is, the publication record of people supervised by famous scientists are often down-graded a bit because the perception can be that the name of their supervisor greased the wheels of publication. In short, being supervised by a famous and influential person can hurt your career chances in some contexts. During the “round table” of an interview for an applicant at McGill, I addressed this elephant in the room by asking the candidate: “So, for your undergrad you work with [Super-Famous Scientist 1], for your MSc you worked with [Super-Famous Scientist 2], for your PhD you worked with [Super-Famous Scientist 3], and for your postdoc you worked with [Super-Famous Scientist 4]. How should we view your work as an independent scientist given such an illustrious set of supervisors? How are we to know how much of the work is yours versus that of your supervisors.” The candidate argued that he was a hybrid of those supervisors, from which something new and original had emerged. I suggest that pedigrees be remembered from an historical perspective but be ignored from a contemporary perspective. The work of any given scientist is their own work (with collaborators) and the person should be judged on that basis – should judging be necessary. When introducing speakers, don’t say who supervised them – say what they do and have done and plan to do! Pedigree is irrelevant at best – and damaging at worst. 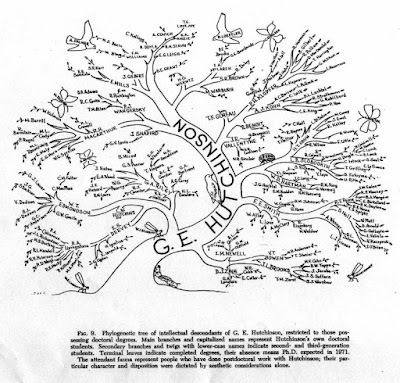 Note: An important distinction can be made between the academic descendants of an individual (like the Hutchinson tree above), which clearly does reflect one aspect of an individual's contribution to the field, versus the academic ancestors of an individual (which I am mainly complaining about).